This indulgent recipe is sure to be a hit with anyone who tries them. In fact, you’ll love the candied bacon so much that you’ll want to make extra, just to eat on its own! 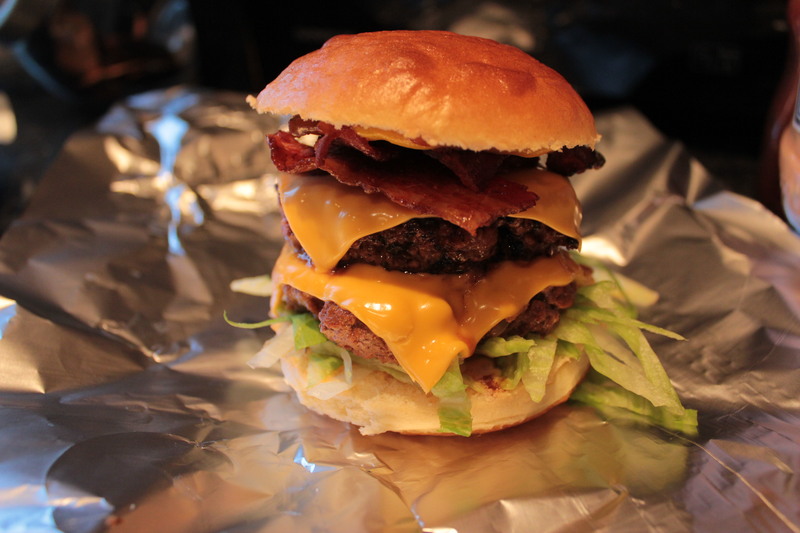 Warning, these burgers are so good, they’ll make you want to cry. – Pre-heat the oven to 180 degrees and layer the bacon over the rack. – Place the brown sugar and maple syrup into a microwavable dish and mix together. Heat in the microwave for 30 seconds or until warm. 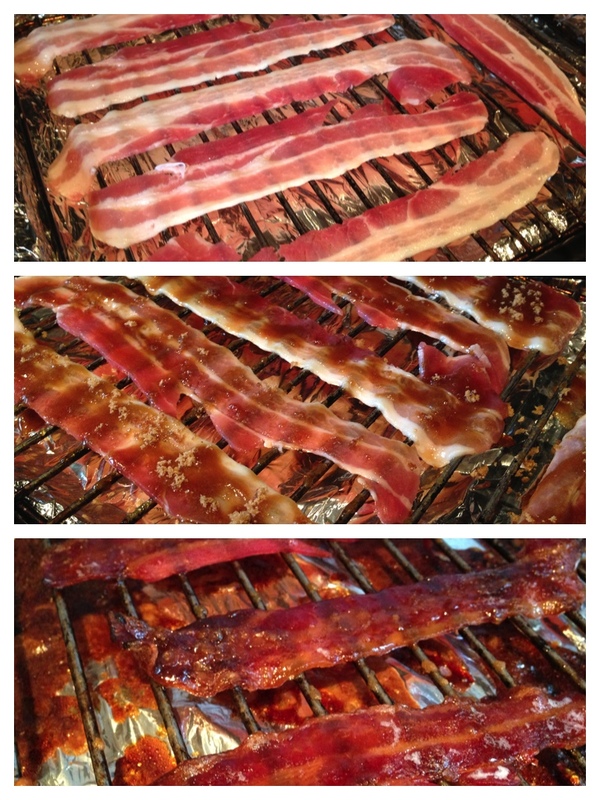 – Use a small basting brush to generously cover the top side of the bacon with the mixture. Once done, flip each slice over and repeat on the other side until all slices are coated. – Place in the oven and cook for 30 mins. Ingredients (top), forming the patties (middle), cooking (bottom). CLICK TO ENLARGE. 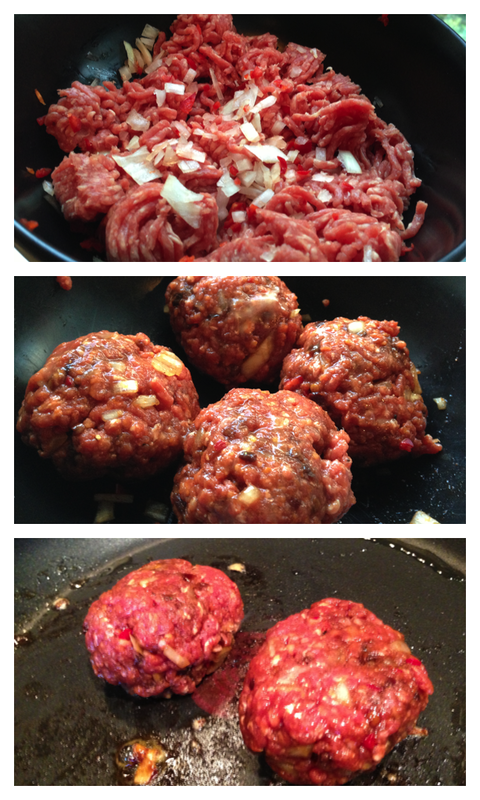 – Combine the mince, salt, pepper, crumbled OXO, chilli, grated onion, chipotle paste & egg yolk in a bowl. Use your hands to mix together and form into four golf ball-sized shapes. 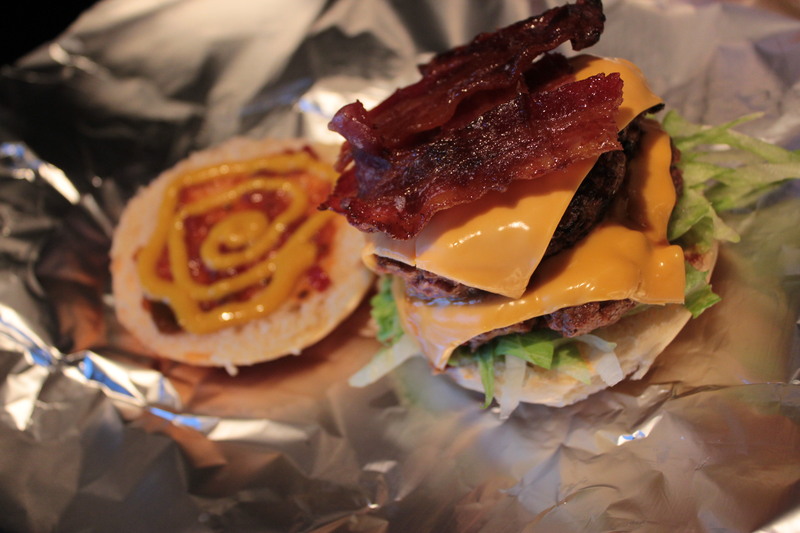 – Half your burger buns and add some shredded lettuce to the bottom half, then set aside. – First, mix together a tablespoon of mayo and a teaspoon of paprika in a small dish. This will give you nice spiced, slightly smokey mayo for the bun. This is our favourite part. 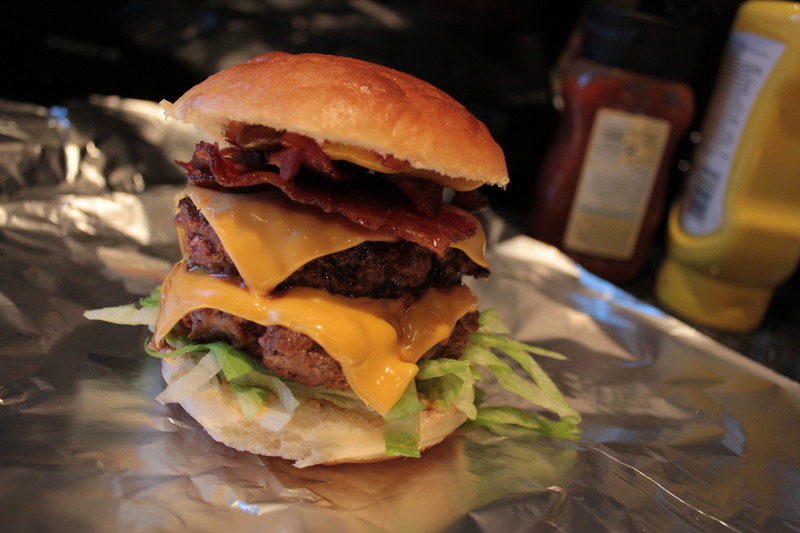 Once you’ve built both burgers, lightly wrap each one in tin foil and place them on the bottom shelf of the oven for a few minutes. This will heat the entire burger a little more and further melt the cheese, meat, sauce and toppings all together for a great look and finish. 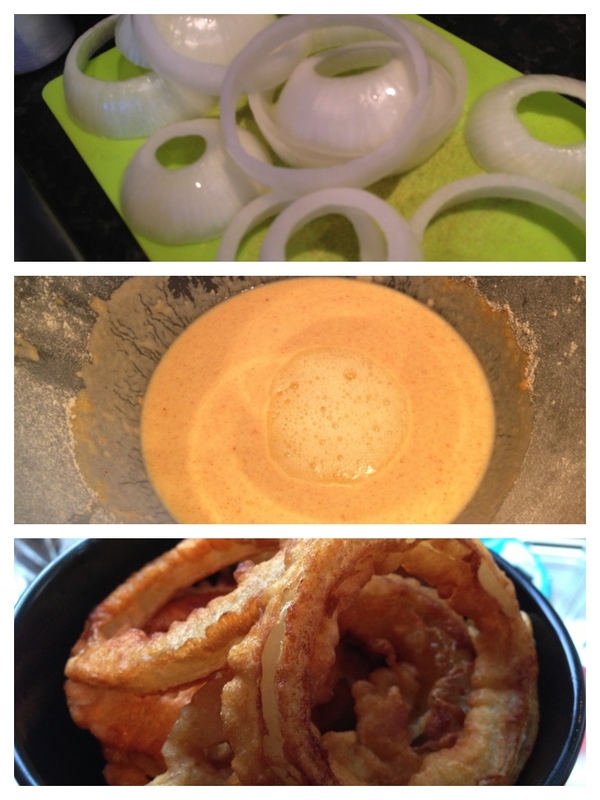 Chopping the onion rings (top), preparing the batter (middle), finished (bottom). CLICK TO ENLARGE. – Sift the flour into a bowl with a pinch of salt and make a well in the centre. Drop in the egg yolks and the oil. Then, add the milk and beat well until this becomes a batter. Cover and stand for around 30 minutes. – Slice the onions into large rings. – Pour some oil into a pan until it’s no more than 1/ 3 full and heat. – Whisk the egg white and add into the batter. 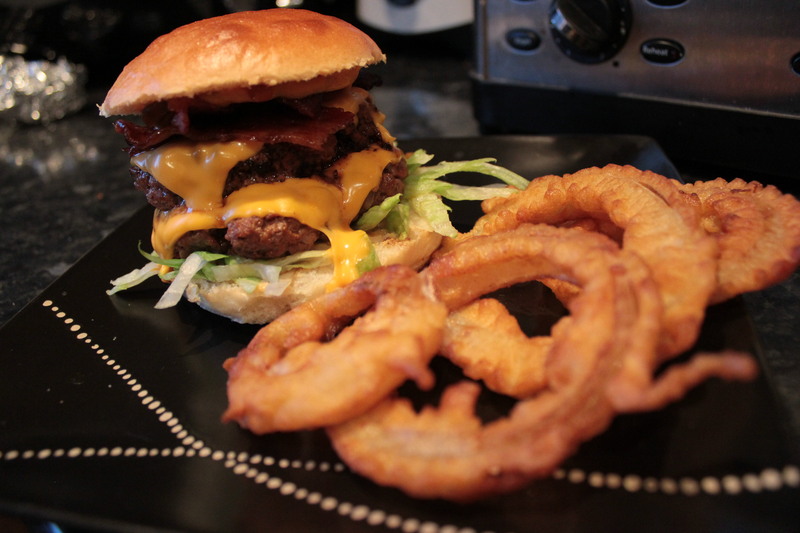 – Dip the onion rings into the batter and drop in the hot pan. Fry for around 4 minutes or until golden brown. Hey, where do you get the American cheese from? All I seem to find are kraft cheese slices and they just turn to liquid! That’s all American cheese is, really. It’s the same stuff you get over there, all Kraft etc. I just call it ‘American cheese’ because I’m used to it. There’s no difference. This looks amazing, think it might be dinner tonight!